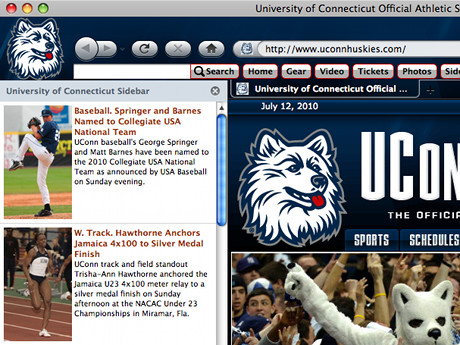 This is the only official browser experience designed especially for UCONN Huskies athletics fans. You'll enjoy a stunning Huskies theme, quick links to the best of www.uconnhuskies.com and a multimedia sidebar for the latest action. Plus an easy way to un-install if necessary. SEARCH: Our primary revenue source is BING. We will reset your default search engine when installed so please give BING a try! PRIVACY: We respect your privacy. We do track some data - but it's only numbers. We follow the total number of active themes, clicks on the extension buttons and themes using our search partners. That's it. UNINSTALL: We hate to see you go but if you want to uninstall, go to Tools - > Addons, and remove the extension from the Extensions tab in Addons. Thats it! ABOUT US: Brand Thunder works with leading brands to develop custom Firefox add-ons. We have worked with the leading social networks, sports teams, news publishers, entertainment and gossip sites, colleges, blogs, radio stations, music as well as our own themes for football, baseball, soccer and the holidays - lots of exciting partners are on the way, so stay tuned!